European stock futures fell, indicating the Dow Jones Stoxx 600 Index may extend a global sell-off, as concern the economic recovery will falter weighed on commodity prices. Total SA and BHP Billiton Ltd. may lead energy and mining shares lower as oil dropped for a third day in New York and copper tumbled to a three-week low in Asia. Xstrata Plc might be active after Anglo American Plc’s board rejected the metal producer’s merger proposal as “totally unacceptable.” PSA Peugeot Citroen may drop after the carmaker said it will have an operating loss of as much as 2 billion euros ($2.77 billion) this year. Futures on the Euro Stoxx 50 slipped 1 percent to 2,337 at 7:13 a.m. in London. The U.K.’s FTSE 100 Index will open 14 points lower, according to IG Markets. Europe’s Stoxx 600 tumbled by the most in two months yesterday as the World Bank said the global recession will be deeper this year than it predicted in March. 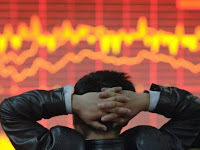 The benchmark last week posted the first weekly drop since May 15 on speculation share prices had outpaced the outlook for economic growth after a three-month rally sent valuations up to 25.4 times earnings, the highest level since 2004. The MSCI Asia Pacific Index declined 2.5 percent today, the steepest retreat in more than a month. Futures on the Standard & Poor’s 500 Index were little changed after the benchmark index for U.S. equities dropped the most in two months yesterday. American depositary receipts of Total, Europe’s third- largest oil company, fell 0.4 percent from the close in Paris. ADRs of Royal Dutch Shell Plc, Europe’s biggest oil company, slid 0.1 percent. Crude oil for August delivery on the New York Mercantile Exchange declined as much as 1.7 percent to $66.37 a barrel today, extending yesterday’s 3.6 percent slide. BHP, the world’s largest mining company, sank 4.1 percent in Sydney trading as copper fell to the lowest in more than three weeks in Asia. Rio Tinto Group, the third-biggest, tumbled 3.9 percent. Xstrata may be active after Anglo American rejected its “merger of equals” proposal, saying the “strategic case for the combination is unattractive” for shareholders. Brazil’s Vale SA, the world’s biggest iron-ore producer, may now emerge as a “preferred buyer” for Anglo’s assets, which may prove “an enticing prospect,” Citigroup Inc. analyst Alexander Hacking said yesterday in a report. The London-based Times reported today that Xstrata may take its merger proposal directly to Anglo American shareholders. The newspaper did not say where it got the information. Peugeot might fall after the carmaker said it will have an operating loss of 1 billion euros to 2 billion euros this year. The company also said in a statement today that it plans to sell convertible bonds worth about 500 million euros that may be increased to 575 million euros. Hypo Real Estate Holding AG might fall after the German lender that almost collapsed amid the credit crunch last year said it expects “significant burdens on income” in the second quarter on risk provisions for receivables and securities. The bank also said it will cut 1,000 jobs. The charges will be “at least in the high three-digit- million region,” the Munich-based company said. Renewable Energy Corp. ASA may be active after the world’s largest maker of polysilicon used in solar panels set the terms of its 4.5 billion-krone ($680 million) “fully underwritten” rights issue. The company will issue 170.45 million new shares at a subscription price of 26.50 kroner each.